There’s a good chance that you navigated your way to this article with the help of our newsletter, Healthcare Success INSIGHT. 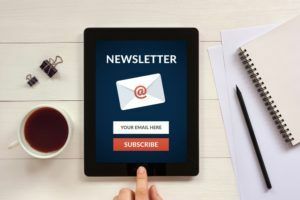 For nearly a decade, our free marketing newsletter and blog have helped subscribers learn how to boost their marketing effectiveness. We thought this was a good opportunity to share some of how this works, and how to create a doctor newsletter to benefit your practice. For nearly all group practices and doctors’ offices, the printed-and-mailed newsletter is a thing of the past. Some health systems, hospitals and wide-base practices still find added value in the ink-and-paper format. But for most providers, the practical and effective option is to create a regular email newsletter or doctor eNewsletter. Like so many other things, the move from USPS mailbox to email format is a societal shift—from “snail mail” to ubiquitous digital email. About 95 percent of us use email routinely, nearly everyone carries a device in their pocket, and we all inspect our inbox account several times daily. There’s strong potential in a distribution channel and potential coverage like that. Regularity and consistency. Our INSIGHT newsletter goes out twice each week. For a healthcare practice, however, it is more common for a doctor newsletter to be distributed once or twice each month. Your primary consideration is to stick to a regular schedule…say the first Wednesday or the second and fourth Thursday of each month. The pattern isn’t as important as being regular. Publish engaging and shareable content. People assign value and importance to newsletter information that is interesting and useful. One goal is to deliver content that motivates a reader to share it with a friend or relative. When a practice doesn’t have the time to generate new (regular and interesting) content, the value disappears. To help busy offices maintain their schedule, we can create new content for your publication. Deliver greater value above cost. Our eNewsletter presents four new and informative articles each week at a subscription cost of zero. The value of a free publication to the subscriber is in receiving practical marketing ideas. Tell don’t sell. Patients and prospective patients rapidly lose interest in content that is a heavy-handed sales pitch. Newsletters bring value by providing valuable, useful information. On balance, promotional messages might be less than 10 percent versus 90 percent content that’s informative and/or educational. Grow your opt-in distribution list. Every successful newsletter has a clear path for new subscribers to join…and for others to unsubscribe. At Healthcare Success we regularly invite new healthcare providers to opt-in with over 19,000 of their professional colleagues. Some organizations will maintain a larger or smaller subscriber numbers. But what’s important with a doctor eNewsletter is (a) to keep your list fresh and accurate, and (b) to inspire continued growth. Promote, cross-promote and increase online visibility. A doctor enewsletter is a versatile marketing tool for any practice. With planning, newsletters promote and cross-promote ideas and content with and among website pages, promotional messages, your blog pages, social media platforms, your YouTube channel and other elements of your plan. Each is an avenue to spotlight useful value as well as to encourage new subscriber sign-ups. Other articles in this series are reminders that a medical practice newsletter—even as a permission-based, opt-in marketing tool—must comply with anti-spam regulations, HIPAA considerations, as well as ethical standards. We’re not offering legal advice here, so to be safe, you may want to talk to a legal representative. And, as additional how-to resources and ideas, use the search box adjacent to this article in our marketing information library. INSIGHT is a free advisory and educational publication about what’s working in healthcare marketing. Circulated twice weekly, it presents ideas and information that are useful, informative and educational to inspire your marketing endeavors.